TheBrain adds a bit of flair and a powerful database back-end to the process of mind-mapping. 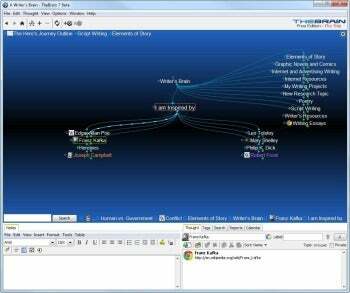 At its core, TheBrain 7.0 is a powerful and flexible mind-mapping program. If you're looking to create a simple mind map for just one project, you could always go with a minimalistic free app like Blumind, or even with mind-mapper favorite Freemind. But if you'd like to create a vast mind map which covers a lot of ground, TheBrain might just be what you need (and its free version retains lots of functionality). The first thing you see when creating a new brain is just a single "thought" against a background called "the Plex." In TheBrain, a thought is just a name for a node in your mind map--much like an "idea" in online mind-mapper MindMeister. Each thought can have multiple siblings, multiple children (sub-thoughts), and even multiple parents. That last one is not an obvious feature, and allows for creating very complex layouts. For example, in a film-related mind map, you could have actor Keanu Reeves both under "male heroes" and under "Matrix cast." The Plex itself hasn't changed much since I first used TheBrain (when it was still called PersonalBrain), about five years ago. It is still visually impressive and fun to use. As you click a thought you'd like to focus on, it smoothly floats over to the center of the Plex, and the other thoughts get rearranged (or shown or hide), all with slick, futuristic animations. One major visual change for TheBrain 7 is that links between thoughts are now curved, rather than simple straight lines. That sounds minor, but when you're working on a huge mind map, it does make a visual impact. Speaking of links, TheBrain's links pack quite a bit of functionality in themselves. Links can have directionality (e.g, "Films" leads to "Matrix"), and they can even have text. This is very useful for making links into specific verbs, so the link from Keanu Reeves to The Matrix could say "acted in," whereas the link from Mr. Reeves to Henry's Crime could say "acted and produced." You can also style links with colors and line thicknesses, and create "link types" so you don't have to define the same link properties over and over again. TheBrain also offers an online synchronization service called WebBrain, which lets you seamlessly sync a local Brain with its online version, and thus, synchronize Brains you're using on more than one system (such as your desktop and a laptop). TheBrain lets you keep and organize all of your thoughts and files in one central place.